at Fair Park Coliseum with doors opening at 6:00P.M. 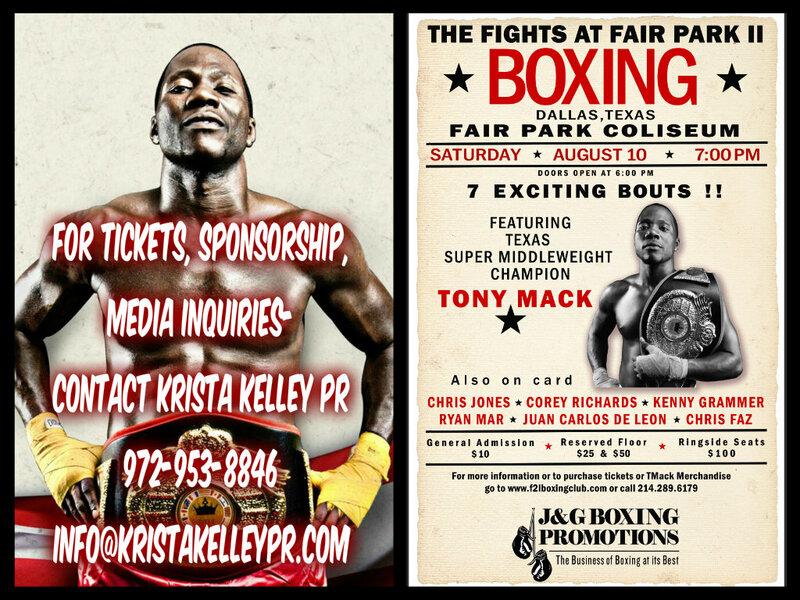 Featured on the Card-Pro Boxing Texas Super Middle Weight Champ, TONY MACK. Also on the card: Chris Jones, Corey Richards, Kenny Grammer, Ryan Mar, Juan Carlos De Leon, Chris Faz. Portion of Proceeds Benefit The Military Justice League and The Wounded Warrior Project. R&B Group MENT 2B will perform. Ask me about featuring your business in the Boxing Program! Sponsors will have an opportunity to meet Pro Boxer Tony Mack! http://bpmgmedia.com/blue-planet-radio. Tony Mack is the current reigning Texas Super Middle Weight Title holder from Plano, Texas.